You know what you're going to see a lot of on my blog? Chocolate cake. Does it even count as dessert without the creamy, earthy, buttery richness of chocolate? And cake is by far my favorite food. I could eat it for breakfast (cinnamon crumble coffee cake, anyone? ), lunch (shortcake with fresh berries and vanilla bean whipped cream) and dinner (this is usually where the only the richest, chocolaty-est desserts will do). In my probably life-long quest for the all-time best chocolate cake recipe, I've made chocolate cakes with mayonnaise, Coca-cola, espresso, melted chocolate, cocoa, you name it. 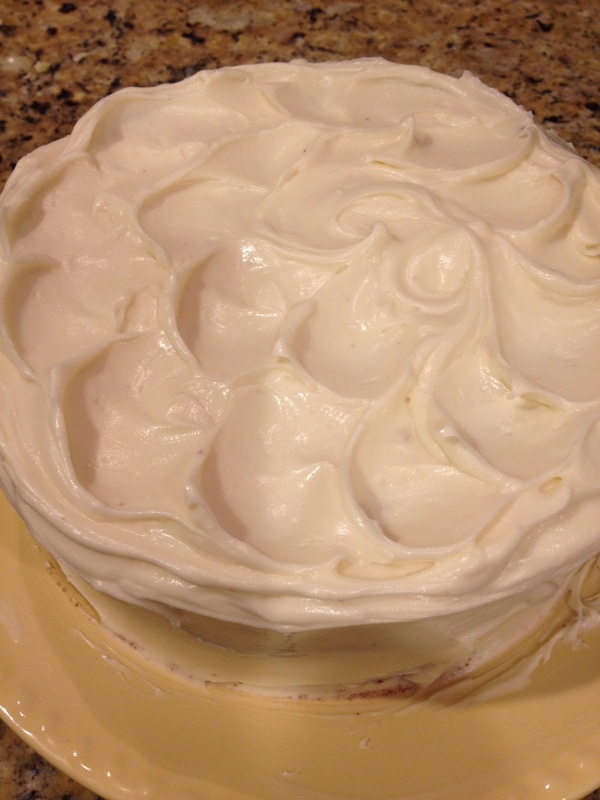 This recipe from Vintage Cakes was divine. With a soft crumb and incredible depth of chocolate flavor offset by the light and fluffy vanilla bean frosting, I heartily recommend this one. 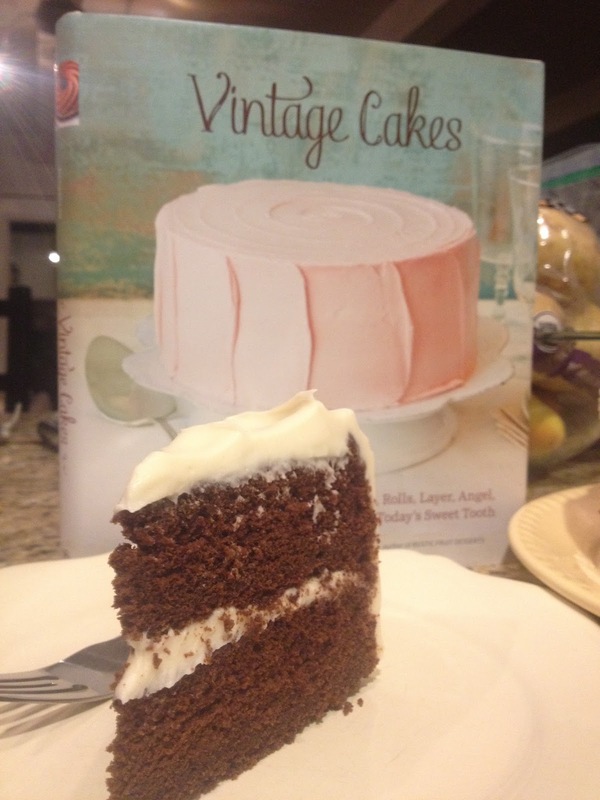 Vintage Cakes itself is such a lovely book with both creative and timeless recipes that I fully plan to make them all...in due time, of course! Preheat the oven to 350. Butter, then sprinkle cocoa into two 8" cake pans. In a small bowl, whisk the coffee and cocoa. Mix in the sour cream, and vanilla and set aside. In another bowl, sift the dry ingredients and whisk to incorporate. In yet another bowl, cream the butter and sugars until light and fluffy, 5 minutes or so, scraping down the sides at intervals to ensure incorporation of all the elements. Gently blend in the yolks and eggs, one at a time. With your mixer on low, slowly add the dry ingredients in 3 parts, and the cocoa mixture in 2 parts, blending only until just incorporated. Divide the batter between the pans and bake 35-40 minutes. Cool 30 minutes before removing from the pans and then completely before frosting. Whisk the egg whites, sugar and cream of tartar and place the bowl over (not in) a saucepan of simmering (not boiling) water. Gently whisk continuously until the mixture is thick, shiny, fluid and very hot to the touch, or, if you have a candy thermometer, reads 130 degrees. 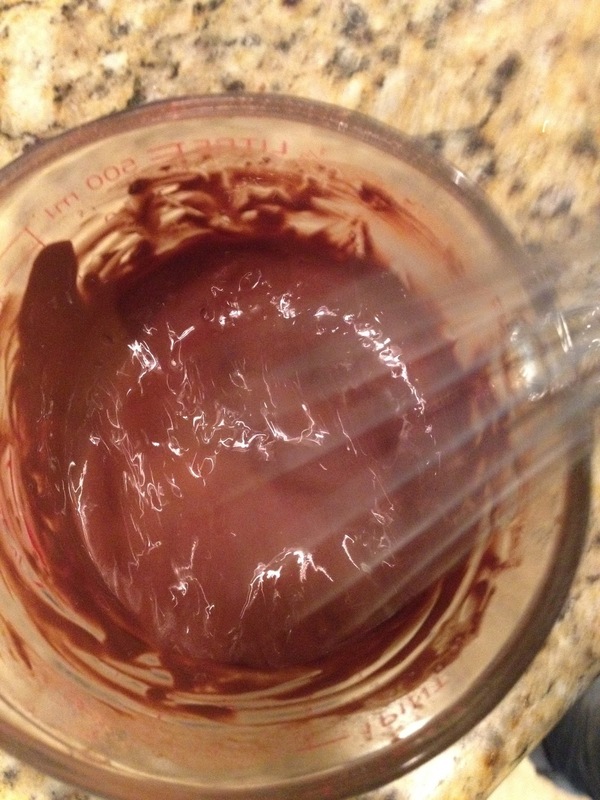 Remove the bowl from the heat and beat on medium high speed until the mixture triples in volume, 3 to 4 minutes. Beat another 1-2 minutes at medium-low speed until the mixture cools down and add the butter in one-tablespoon chunks, beating well after each addition. 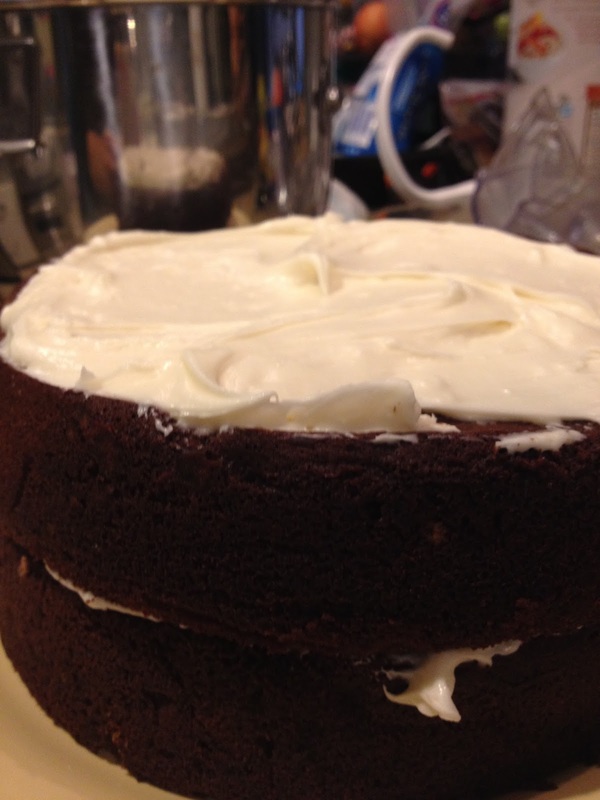 (Ms. Richardson notes the buttercream will look curdled and lumpy at one point. That's normal and will correct itself. Press on through!) Add the vanilla bean paste and salt and mix. Frost the cakes with a thin crumb layer and refrigerate for 10 minutes. Spread the rest of the buttercream over the chilled crumb layer and let the cake set about 30 minutes before slicing into it, if you can stand to wait. This cake makes a beautiful celebration cake and can be made a day ahead, if need be. Enjoy! Looks ABSOLUTELY delicious!! Can't wait to try your recipe and find the book!! Thanks!! Thanks, Amy! I found the book on Amazon for $13. Enjoy!